I started the year with a salad then January was the month of pomegranate here at Disturbingly Delicious and yet, here I am with another salad and, surprise, pomegranate again. I do not know how it happened. It seems that this will be the year of salads. Or maybe not, because I don’t want you to get bored of all this light stuff . However, this will be the recipe to inaugurate the Meatless Monday series, a concept I was familiar with but I’ve only thought to adhere to it inspired by the awesome team from Milk and Toast and Honey :). Remaining in the Mediterranean area we’ll start with a salad we like a lot. As you might already know, I love simple dishes with few ingredients but this does not mean they lack of taste. Oh no, not at all. My dishes are tasty and full of color, and so is this salad. 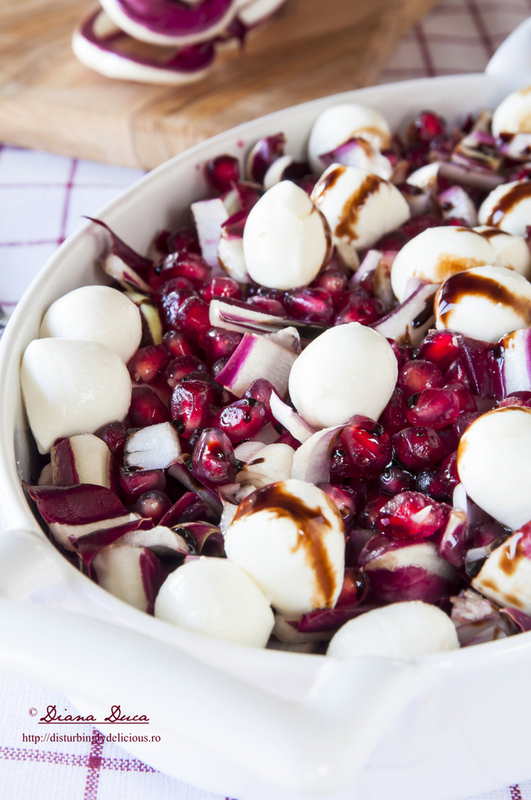 Imagine together radicchio, mozzarella and pomegranate. 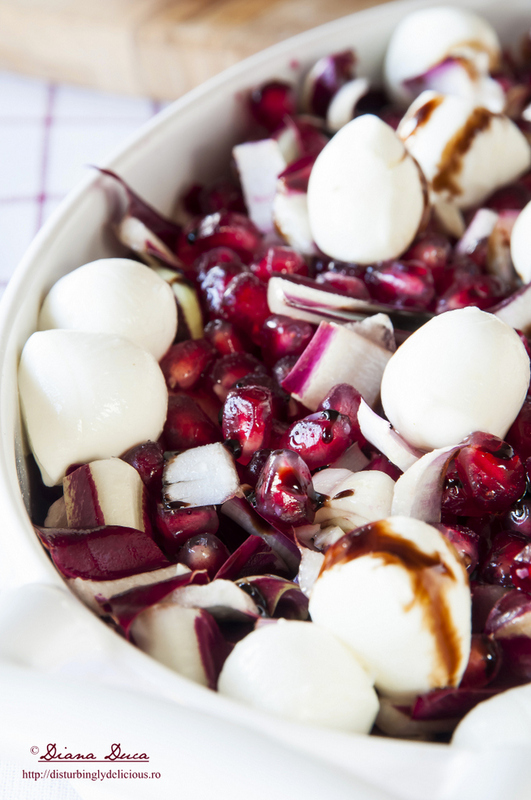 I guess you get the image of a happy salad in which the creamy mozzarella meets the crunchy radicchio and the sour sweet pomegranate seeds in a song of flavors and textures. Well, you got it right.The only thingyou have to keep in mind is to use the right type of radicchio and I think we’re gonna need to talk about this. As you might know, radicchio is very popular in Italian cuisine but what you might not know is that there are various types of radicchio. The most popular are Radicchio Rosso di Treviso (the leaves have a long conical shape similar to Romaine lettuce), Radicchio Variegato di Castelfranco (it looks more like a traditional lettuce that has cream-colored leaves with deep wine red stripes) and Radicchio di Chioggia (it has a round shape more like a cabbage and it is also known as Chioggia rose).The first one comes in two varieties: Precoce (premature or early) which has a shape similar to the Belgian endives and has a strong bitter flavor and Tardivo (tardive) which has splayed leaves and it is more delicate and less bitter than the previous one. I normally use the Treviso and Chioggia ones as they are great grilled or for risotto. For this salad, I prefer the radicchio tardivo as it is crunchier and less bitter. So, in case you want to try it I advise you to use the same otherwise you won’t like it. And now, after a bit of history, I guess it’s time to go back back to our salad . 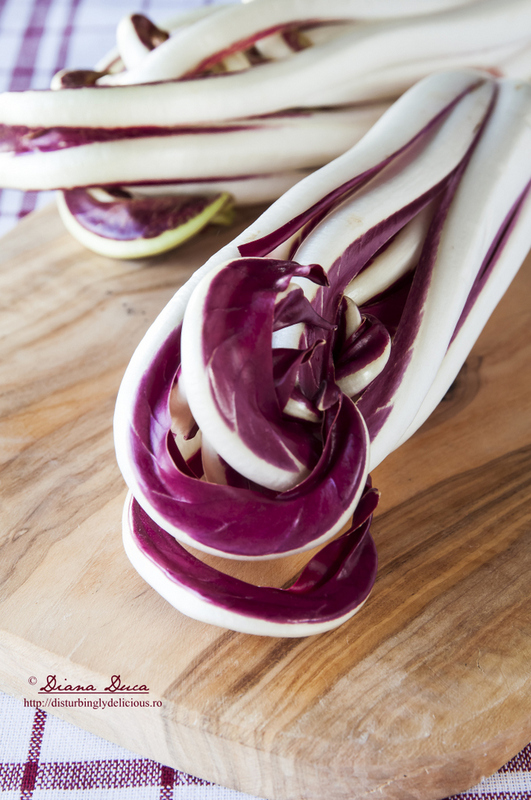 Wash the radicchio and cut it into pieces of 2-3 cm; put it into a serving bowl. Add half of the pomegranate seeds. Season with salt and pepper, drizzle with olive oil and balsamic vinegar glaze and toss thoroughly to combine. 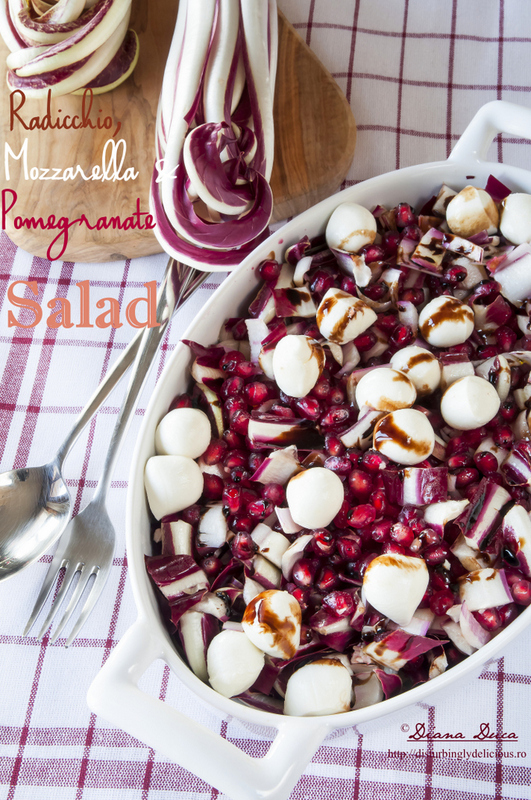 Add the mozzarella and the remaining pomegranate seeds. Drizzle with a dash of balsamic vinegar glaze. - You can use mozzarella di bufala or burrata instead of cherry mozzarella. - You can use balsamic vinegar instead of balsamic vinegar glaze though I prefer the second one. As you can see it is so simple to prepare this salad but the result is great. Apart from the chromatic element which will give your meal a happy note, it is fresh and flavored. At the same time I find it quite an elegant dish and you may prepare it for special occasions too. I am sure you will impress your guests. Ce salata vesela si sanatoasa. Arata foarte bine salata si pozele sunt de revista. Felicitari!